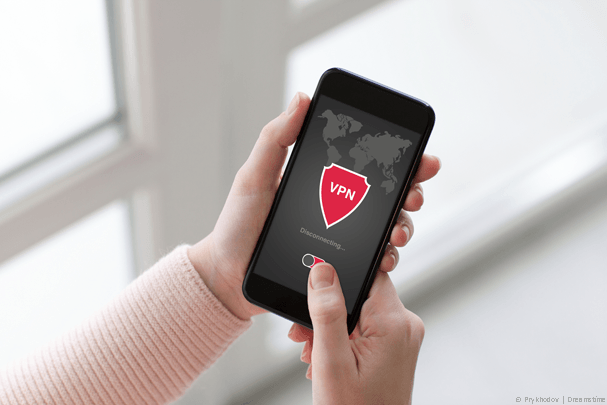 VPN use is essential on your Android device these days but installing a VPN apk without the Google Play Store can seem like a daunting task. Thankfully it isn’t as difficult as it sounds but we’ve put this little guide together to help you through the process. You’ll be pleased to know that installing an Android VPN apk without the Google Play Store is actually relatively straight-forward and owning an Android device certainly helps that process. Apple users are not so lucky and with app installation being rather restrictive on iPhones and iPads it makes installing a VPN apk extremely difficult. The first thing to consider is VPN provider. The positives of a paid-for VPN service far outweigh the negatives of a free VPN service. If you want more information about free VPN services and why they’re really not worthy of being classed as a VPN service then read here and here. Now that we’ve got free VPN services out of the way you’ll need to consider what VPN service to sign up to. Not all VPN services allow you to download the apk file directly so it’s important to use a VPN service that does. This certainly isn’t an exhaustive list of VPN providers who offer apk downloads but these are tried and tested so we can vouch for their reliability. IPVanish – Save 25% off using this link. Your first step should be selecting one of the above providers that meet your needs. If your only need is to be able to download the Android apk outside of the Google Play Store then they all cover that. We would recommend IPVanish because they’re our top rated VPN provider, but both NordVPN and VPN.ac are just as good. If you’re interested to find out more and you’ve got time on your hands then take a look at our latest IPVanish Review, NordVPN Review and VPN.ac Review. Once you’ve selected one of the recommend providers who offer VPN apk downloading you’ll first need to enable your Android device to accept apk downloads from sites other than Google Play Store. On your Android device select Settings. Scroll down to find Security and tap on it. Scroll down the security menu and locate the option Unknown Sources – Allow installation of apps from unknown sources. Swipe the button to enable this option. Once this option is enabled you can return to the main menu on your Android device. Next launch your favourite mobile web-browser and head over to the website of the VPN provider you signed up to. Below is a list of locations of the VPN apk apps for all three recommended providers. On the IPVanish homepage click on Apps. Then click on Android then click Direct APK Download. The IPVanish apk will now download to your mobile Android device. On the NordVPN homepage click on VPN Apps. Then click on Android then “Or download the NordVPN .apk file“. It’s the very small text under the main download buttons. The NordVPN apk will now download to your mobile Android device. On the main VPN.ac homepage click on Tutorials. Then under the Android logo click the text “APK download“. The VPN.ac apk will now download to your mobile Android device. Once you have downloaded the apk file you need to navigate to your apps menu. Find the “Downloads” app and click on it. Inside you will find the name of the VPN provider apk. Click on this and follow the instructions to install. You are now free to use the Android apk app as normal without the need for any involvement from the Google Play Store. When you’re downloading the Android apk from your VPN provider website there should be relatively little to be concerned about. You can if you wish check the MD5 hash of the file you download with that displayed on the VPN provider website to double check the downloaded file is the one they intended you to download. This isn’t really necessary because someone would have needed to have intercepted your download or hacked the VPN provider website to supply you with a sketchy apk file. For peace of mind though the option is there. 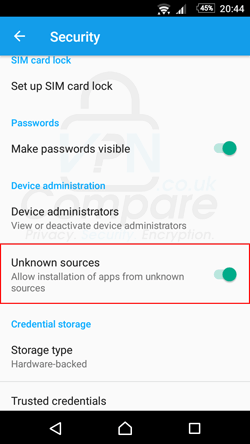 More important issues to be aware of is downloading a VPN apk or any apk for that matter from an unknown or untrusted website. You may be tempted to download the VPN provider apk from one of the many apk downloader websites such as APKPure, Evozi, APK-DL etc. This in itself is extremely dangerous as you can not be sure the version of the VPN apk is the original from the VPN provider. It could possibly have been tampered with the enable it to steal information from your device. It’s important to remember not to download the VPN apk from any other source but the original website of your VPN service.